Tasteful rooms in the seminar house Soul Joy in the Villa la Perla in the Algarve in Portugal. The villa La Perla in Carvoeiro, on the beautiful cliff-side Algarve in southern Portugal, is a typical Moorish-style Vivenda with a large round entrance tower adorned with a pink flowering Bourgonvillea. The rooms are tastefully furnished, there is a shell room, rose room and a sea-green suite, a generous dining room with a handmade Moroccan table and a cozy living area with fireplace. The vintage style bathrooms are decorated with original Portuguese wall tiles. Various verandas overlooking the garden are serving as an outdoor dining area and lounge for chilling in the shade. Swimming pool of Villa la Perla in Portugal to chill during the workshop breaks. The swimming pool and the terrace are accessible from both, the shell room and the sea-green suite. If the sun wakes you up in the purple rose room and you open the blinds, the figs are within your reach or you dwell in enjoying the sight of the valley. Experience the heatable, rainbow-colored shimmering healing crystal basin with 17 natural mountain crystals and a citrine. The arrangement of the 12 crystals is aligned both to the magnetic poles of the earth, as well as arranged in a circle according to the cardinal directions – and are based on the 12 signs of the zodiac. The crystals embedded in the four corners embody the vibrational balance of the four world mountains: the Alps, Andes, Himalayas and the Rocky Mountains. In the whirlpool with pleasant 32 degrees warm water you can pamper your body and let your mind relax. In the outdoor area is also a small rainbow-colored tiled bathroom with shower, toilet and sink, and a barbecue place near the pool. 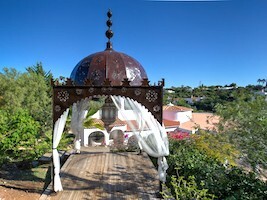 Seminar house Joy of the Soul in Portugal, with meditation pagoda, healing crystal pool and Jacuzzi in the garden. There is a beautiful octagon-shaped meditation hall. At the top of the garden is a Moroccan pagoda with sweeping views across the valley, that invites for yoga, meditation or outdoor dining. To recharge your batteries, it is possible to sit or lie in the middle of a large Venus flower in the grass. Take part in a wonderful cave ride near Carvoeiro. Here is the famous rock formation “Algar Seco”. Over the years, the tides have created breathtaking caves, grottos, plateaus and pillars. The big cracks in the walls create a special atmosphere here. The Vivenda is located in the old established Carvoeiro Club close to the center of Carvoeiro and various beaches such as Praia do Paraiso, Carvoeiro-Praia and the wild beach behind the property, which can be reached with good climbing shoes. From the closest airport Faro a shared taxi brings you to the seminar house.